I've been thinking a lot recently about how the names of Chinese foods vary so much between China and the US. One example is lemon chicken. In Southern China, lemon chicken usually means a whole bone-in chicken, steamed, chopped up, and served with a light lemon sauce. In the US, you'd get perfect cubes or slices of breast meat that has been fried and coated with a thick lemon sauce. (In other words, more like this.) A few places, like this takeout spot in Park Slope, may serve you something that looks like a lemon chicken kit that you put together: breaded and fried chicken with little seasoning, on top of some iceberg lettuce, and a container of something that's more or less lemon simple syrup. Another example is Mongolian beef. 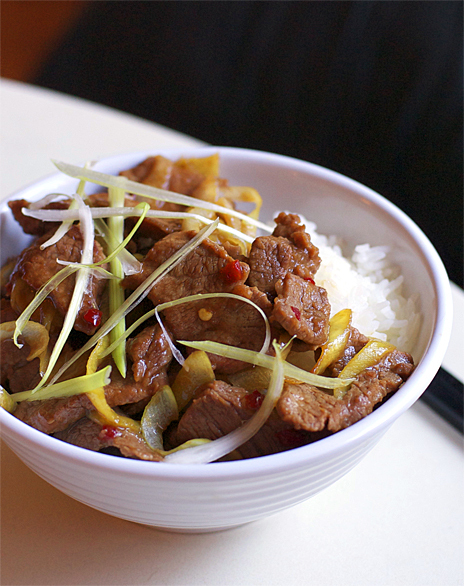 In Beijing, Mongolian-style lamb or beef is stir-fried with toasted cumin seeds and whole red chilis. In the US, what has become Mongolian beef lacks any whole spices, but is pretty tasty in its own right. The only thing similar to its mainland Chinese cousin is the thinly sliced steak and abundance of leeks. The sauce, when done well, is pretty terrific. The beauty of Mongolian beef sauce is that none of the flavors stand out on their own, but rather, come together (as the Chinese would say) "harmoniously". Readers also often ask me what kind of chili and bean sauces I use, since these sauces show up so often in my recipes. 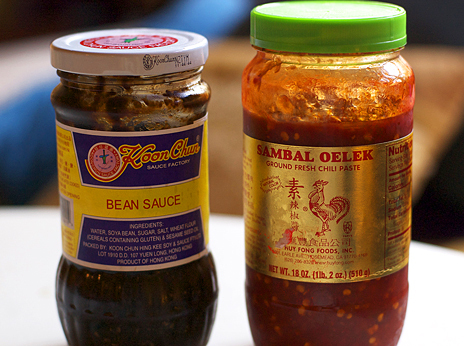 Here are the two I used for this dish (and many of the other ones in recent months): sambal oelek from Huy Fong foods (aka "the Rooster Brand") and Koon Chun bean sauce. I tend to use them the most, out of all the sauces in my fridge, because they have fewer additives than Lee Kum Kee and other widely distributed Chinese sauces. For the chili sauce, I also somtimes use the Union Foods brand, sold at Whole Foods in the international food aisle. If you have a jar of chili bean paste or sauce around, just use one tablespoon of that in place of the 2 teaspoons each of chili sauce and bean paste. By the way, has anyone in San Francisco tried this Mongolian beef cheesesteak at a place called HRD Coffeeshop? I can't believe it was only two blocks from my old work place in San Francisco, and I never knew about it. Such a missed lunch opportunity. If the Moo Goo Gai Panini I had a few months ago is any indication, Asian stir-fries coupled with cheese in sandwich form taste much better than they sound. Marinate the beef: Stir together the soy sauce, grated ginger, and cornstarch together in a medium bowl until the cornstarch is dissolved. Toss the sliced beef in the marinade to coat. Let stand for 30 minutes to let the flavors absorb. Heat a wok over high heat until hot. Add the oil and swirl to coat the sides. Stir-fry the beef until barely pink in the center, 2 to 3 minutes. Add the leeks and stir-fry until wilted, about 30 seconds. Pour in the sauce and make sure the beef is well coated. Stir-fry until the beef is cooked through, another 1 to two minutes. Remove from the heat and garnish with shredded scallions.